Titov Vrv 2.747m is the highest peak on Shar Planina (link do Sara ) (the biggest massif in Macedonia). 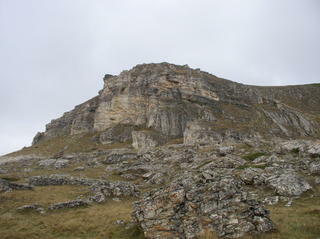 This weekend my friends Nenad Radeski and Jane Stefanov and me climbed Titov Vrv in four hours on non-standard route. 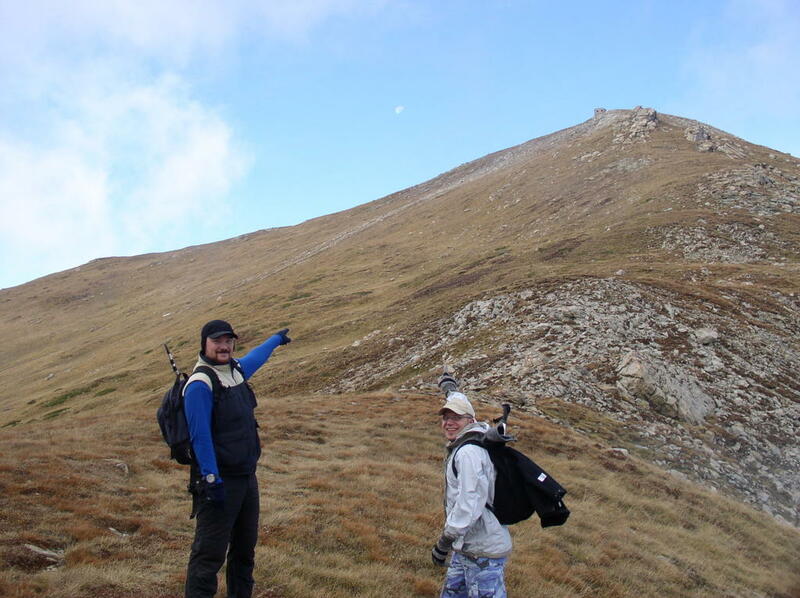 Nenad and Jane pointing at the summit. 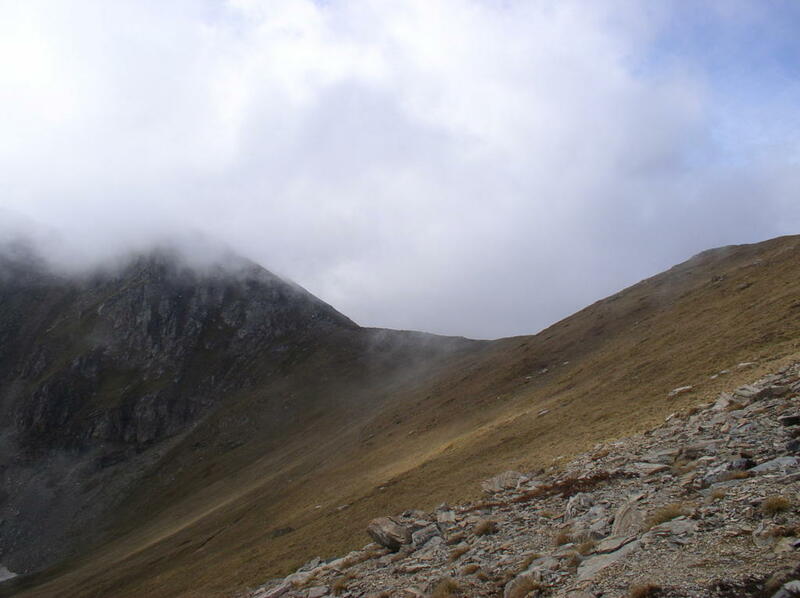 This is funny thing but the route was not standard by mistake we done take right one kilometer before the mountaineering markation and this prolonged ascent to the summit for one more hour. However like all mountains in Macedonia – Sar Planina was gorgeous that day. .... and from here let’s say demanding walk for 2 hours with some near vertical climb (not technical and rock-climb) and the summit is there. On the very summit there is something that we could named hut it’s open but there is nothing inside – so in a way this are build rock without windows, flour etc. 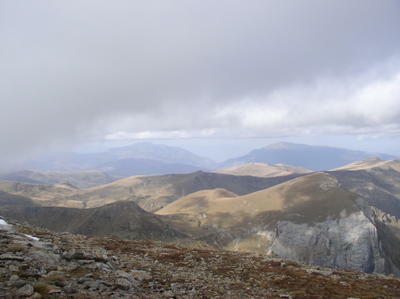 View from the summit is wonderful the Sar Planina massif is visible if the weather is nice. When we arrive on the summit the sun show up – the goods liked us. 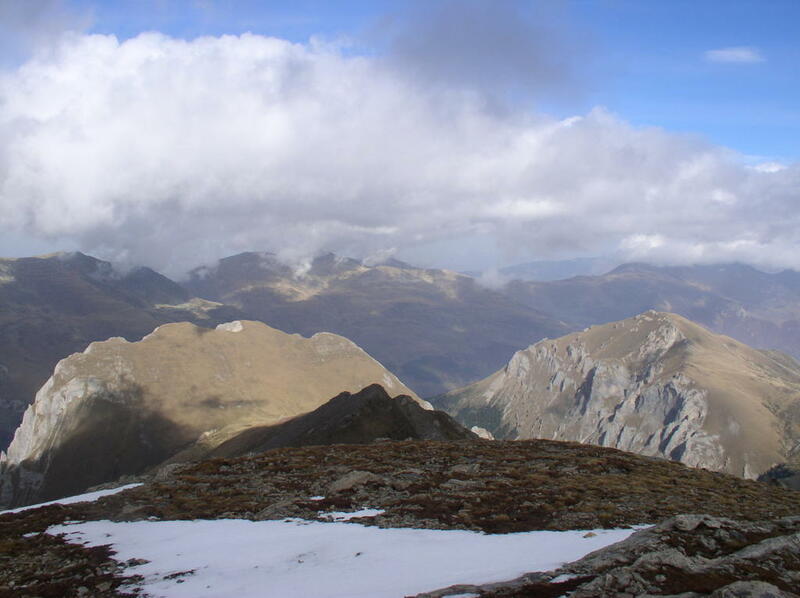 We sow the first snow this upcoming winter on the top. On the way down the weather become very bad with low visibility and heavy wind. We meet four experienced mountaineers descending and we wait 30 minutes for them so we could go together. This was good decision for several reasons. But the most important for me was that between them was Petar Mitrov – Pepi member of Macedonian Aconcaqua expedition in 1994. 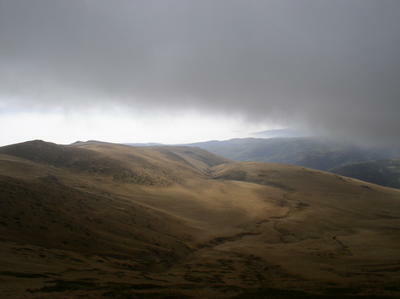 He (left on the photo) summited Aconcaqua in only five days from the base camp. I ask him a million questions regarding the fact my plans for Aconcaqua-climb in the near future. This experience meeting him was excellent. New thing is that I admit – I have some Aconcaqua plans for very near future, but before I start to post information about I would like everything to be finished: dates, training process, money, team…and more. 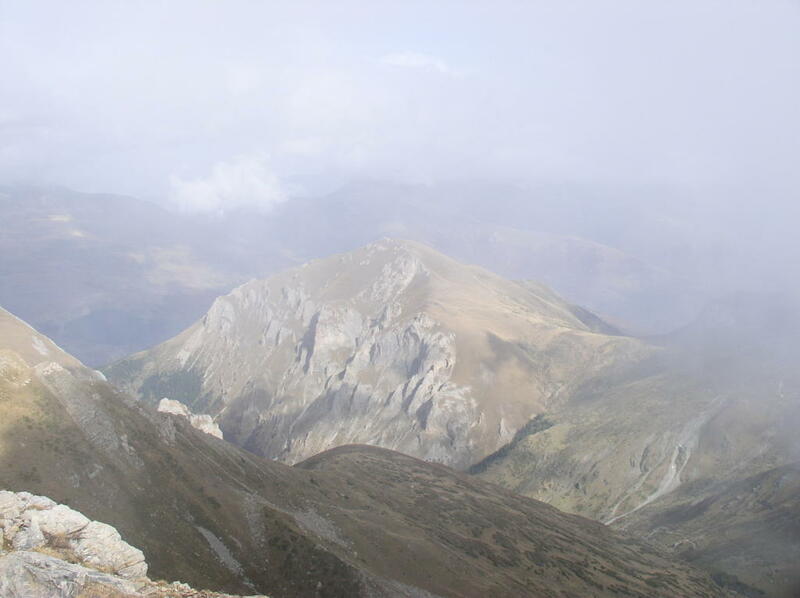 How my body felt climbing Titov Vrv? My stomach give me a hard start first one-hour (I solved the problem but it was very cold). My upper body is in good shape and this is maybe my strongest side. 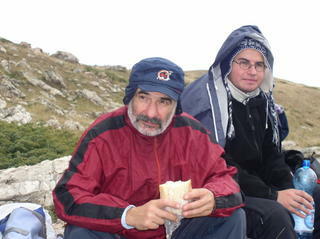 During the climb I had some 8 – 10 Kg on my back and I was walking without problems. However I still must work on my stamina – a lot of cardio exercises. Also must lose some weight I thing this is crucial for my knees. They were OK regarding the ITBS problems, but before summit I felt some pain in front where the kneecap is. It was not big pain, but I don’t want to have it again. 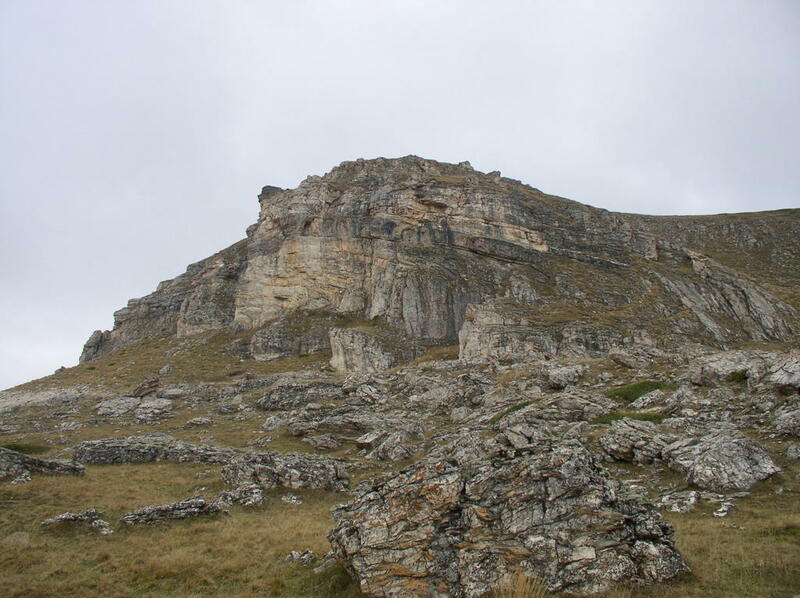 How my spirit felt climbing Titov Vrv? Haaah…excellent. 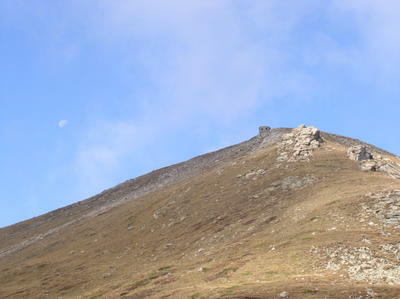 Here is the place for one of the best photos from Titov Vrv - moon and the summit. 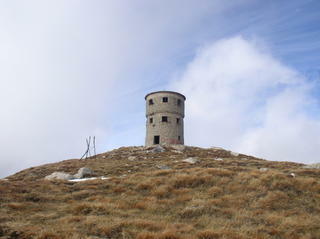 More photos from Titov Vrv very soon will be add in the photo page of this blog. nuki ,ti go sledam blogov od samiot pocetok i sakam da kazam deka se nadevam deka entuzijazmot kje ti se odrzi ! plus ,fala za nekoj od linkovite . Мислам викендов поточно во недела бидејќи во сабота работам - да го скршам рекордот одам на 60 - 65 минути, но ќе видиме. P.S. Можеш слободно Миле да ме викаш. ok . a od kaj merish? Aj meri od kaj fontanata. Pominuvash od kaj policijata i meri od kaj fontanata. се придружам онака пеш на некоја од твоите тури.